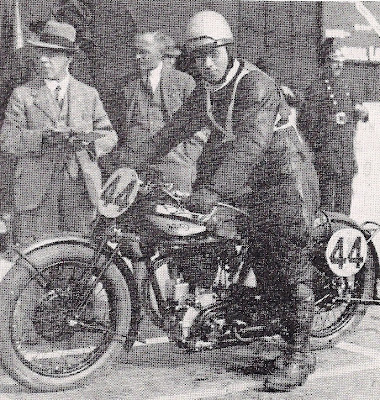 -SG- This photo of Harold Daniell in the 1931 MGP shows it's not always that easy to identify a Norton! 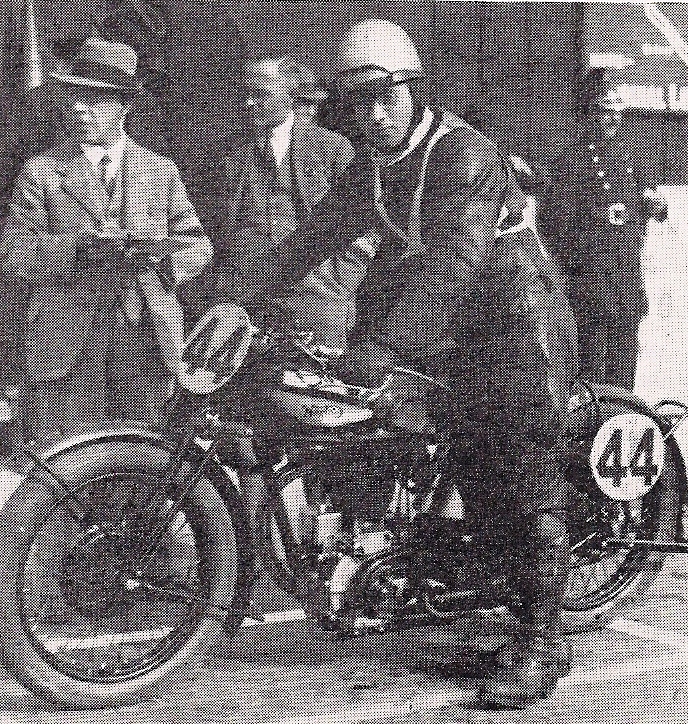 Harold had a three stay CS1 bought in 1930 on which he retired in that year's MGP. It was sent back to the works for updating and came back with a new two stay frame, four speed box and engine updates etc. for the 1931 event. This explains why the photo above, taken in 1931 shows the bike with Webb forks, two stay frame - but still with the 8 inch Enfield front wheel and the oil box on the front engine plates from its 1930 origins. Another giveaway is the 1930 paint scheme. Note the 19" wheels. Model: CS1 Engine number: 49061 Frame Number: 42523 Gearbox Number: 161375 (this is a Vintage three speed LS type box) Forks: W650 (ie TT Webbs) Extras: Two Racing twist grips, TT Large Tanks, Oil Filler on left, Petroflex Pipes, ML Magneto, Specially tuned engine for RD1 (ie alcohol fuel). Despatched 1/8/30 to A L England, East Pennard. Retail customer : H L Daniell, 37 Winn Road, Lee, London SE12, who took delivery 9/8/30. Quite why Daniell - who I understand was already in the garage business with his brother - obtained the bike through a company in a small village in Somerset, a hundred miles away, I cannot imagine! Incidentally, use of alcohol fuel was permitted in the MGP. This particular machine seems to form part of a small group possibly despatched in time for the 1930 MGP although they are not lsted as 'Special for Manx Grand Prix' like the '31 machines already featured. The adjacent one with a rather similar specification was despatched to none other than Ron Harris of Maidenhead.